I’ve started a collection of Gyo Fujikawa illustrated childrens books. No, there is no baby on the way and perhaps never a baby on the way, but should there be anyone under six years of age in the area I might pounce on them with my book collection. 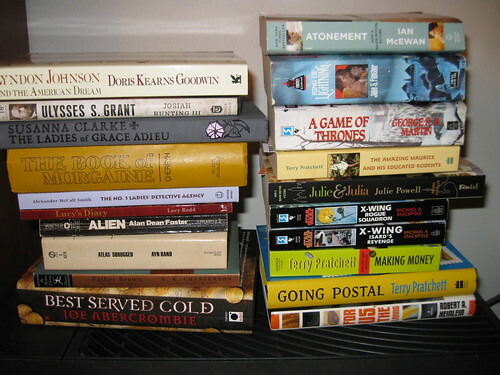 My “To Read” pile has gotten ridiculous. And these are just the ones I own. There are more out there that I’ve found the self control not to buy. So far at least. Made another interesting find at the Goodwill. 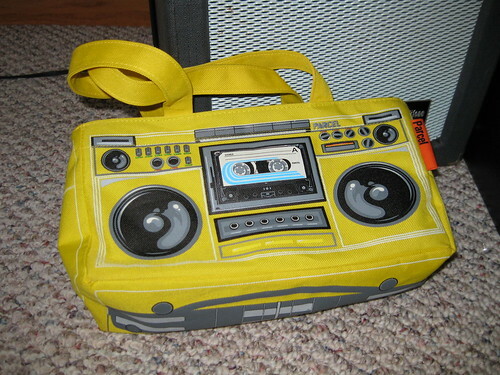 I believe this is a Loop NYC Parcel “Boom Box” bag. Or perhaps an imitation. All the ones I f ind online have actual speakers built into them but this one doesn’t. Still, for $3.50 I thought it was a good find. It is a squarish tote (better picture behind the cut below) that I could see myself using as a purse that can safely carry a few paperback books in without squishing them like my bags normally do. Also, I came from a time when people still had boom boxes and tapes and stuff so the nostalgia isn’t lost on me. I wish it actually played music though. The examples I found online all have speakers built in so you can plug in your iPod and share your music. Either this is a economy model or was bought off the streets of Guangdong for all I know. It even has pictures of all the bits on the back including wall mounting it seems. I never used that feature before and just figured out what it was now.